Police are hunting for two men - Andisile Ncanyelo and Njabulo Thokozani Khumalo - who escaped from the Gauteng High Court in Johannesburg on Friday morning. It's understood the men fled through a rear entrance at the court building. Court documents show Ncanyelo, 29, and Khumalo, 28, were facing separate cases. 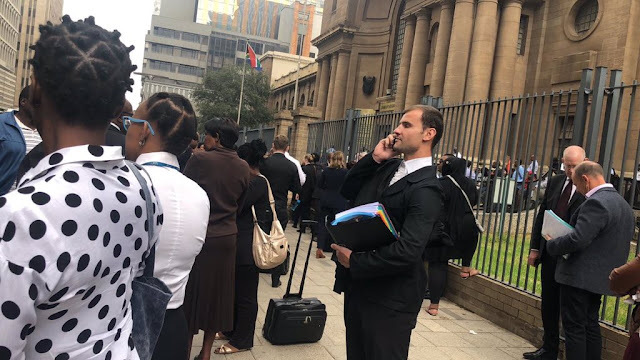 Khumalo - who is facing three counts of murder and two of attempted murder - was due to appear for a pre-trial hearing, while Ncanyelo was due to be sentenced for murder and attempted murder, along with two accomplices. Lieutenant Kay Makhubela says the escape happened during the court's "rush hour period" when suspects are brought to the building from various prisons. The two escapees were being held at Johannesburg prison. Makhubela says members of the public should not try to apprehend the pair as they are considered dangerous.